If your garage is catching direct sunlight, then you definitely stand to gain from adding a radiant barrier inside the garage on the door and/or any other walls that are catching direct sunlight from the exterior. Keep in mind that a garage is typically not conditioned (being heated or cooled) so the results are more about tempering the heat gain in the summer. To really maximize results in the garage, you want to address any and all surfaces catching direct sunlight. 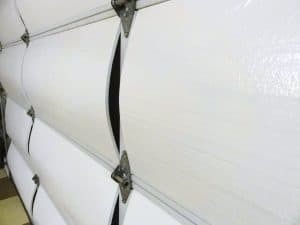 If your garage door does not catch direct sunlight, then adding the radiant barrier to the door is not going to make a difference in cooling the garage. 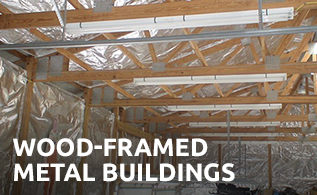 Radiant barrier is effective when there is radiant heat, so address any and all walls/surfaces that get sunlight. The simplest and fastest way to cool the garage is to add radiant barrier to a garage door. You can use foil on it’s own (simply screw the foil to the garage door frame or use magnets to attach it) or you can use foam board with foil attached to one side. 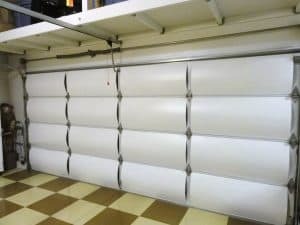 Using the foil-faced foam board allows for the air gap to be between the foil and the garage door. It’s an easy, no-mess alternative to other options: no glue, tape, etc. You can purchase foil-faced foam board at the home improvement store, to make this application super easy. 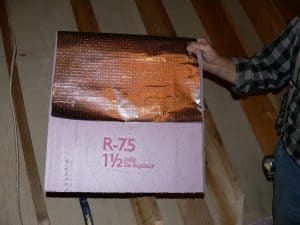 This application works best when you cut the foiled foam board into rectangular pieces slightly larger then the opening in the garage panels, this allows you to pop them in under the metal frames. 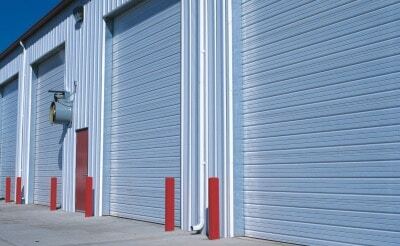 Be sure there is an air space between foil and garage door. 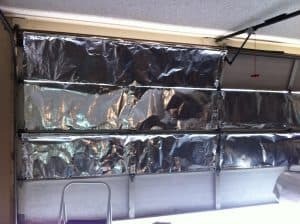 If your garage walls also catch direct sunlight, then you should add a radiant barrier inside the garage on the walls that are catching direct sunlight from the exterior. *Note: if keeping heat out of the garage is your goal, you’d ideally want the foil closest to the outside (i.e. in between the walls studs). For more info on how to install inside of external walls, check out Putting Radiant Barrier Inside Wall Cavities. In addition to adding a radiant barrier, you should consider adjusting the proximity switch on the garage opener to allow a 1-2 inch gap at the bottom of the garage door. Then create an opening at the top of the garage to create a ventilation channel. This ventilation path will allow the air temp in the garage to stabilize and become close to ambient (outside) air temperature. Another option to vent this space is to open a window or two during the day to allow air to flow. 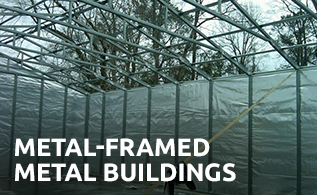 The foil should be installed around windows, so as not to obstruct them or the path of air flowing in/out of them.